Twenty years ago, on Sunday January 25th, 1998, the savage Tamil terrorists attacked by means of a bomb blast, the Sri Dalada Maligawa – one of the greatest national treasures of our country. Built originally in the late 15th century, this fabulous architectural marvel is more than 550 years old. In the centuries that followed, on the initiative of several kings, improvements were made to the Dalada Maligawa, making it one of the most captivating historic buildings in the country. Several pilgrims including children who were at the Dalada Maligawa died on the spot along with several police personnel providing security at the Maligawa entrance at this time. This magnificent structure enshrines the sacred Tooth Relic of the Buddha which is the most sacred object of worship in the Buddhist world. It is of utmost symbolic value for Buddhists and the Nation as a whole, because from historic times the possession and custodianship of the Sacred Tooth Relic was tantamount to acquisition of the sovereignty of the nation. It was first brought to Sri Lanka in the fourth century CE and has been treated with utmost veneration by our kings of the past. The possession of the Sacred Tooth Relic was required for a king to be acknowledged as the ruler of the country. Cruel and violent actions, characteristic of Tamil terrorists reached their highest levels with this ghastly event of bombing one of the most sacred places of veneration of Buddhists across the world. Structures and monuments associated with the entrance to the Dalada Maligawa were subject to severe damage. The blast led to the demolition of a good part of the roof and the exposure of the Dalada Maligawa to the open sky. Extensive peeling off of the wall plaster resulted in the destruction of exquisite paintings that adorned these walls besides damage to other priceless artifacts of the Maligawa. The bomb blast resulted in the total destruction of two of the most precious items of the Maligawa – the historic granite moonstones sandakada-pahana’ that were found at the main outside entrance to the Maligawa before the rock pandol, and the equally precious moonstone at the entrance to the ‘ambarava’ which is the tunnel-like entrance to the ‘hevisi mandapaya’ of the Maligava. ‘Hevisi Mandapaya’ is the open verandah-like area with granite pillars where ‘pujas’ and drumming are performed. These two outstanding sandakada pahana were among the few most precious moonstones of the Mahanuwara era, that observed the design and shape of the unique Mahanuwara moonstone tradition, somewhat similar to the one at the entrance to the Degaldoruwa Rajamaha viharaya. The blast damaged the granite rock pillars before the ambarava, adorned with exquisite rock carvings of enchanting traditional motifs. The bomb attack resulted in the complete destruction of the enchanting paintings of the ‘Ambarawa’. The entire curved surface of the Ambarava was adorned with vibrant breath-taking paintings that belonged to the 17th and 18th centuries. Many ancient ola palm leaf manuscripts and delicate traditional ornaments and artifacts stored in the Pattirippuwa octagonal building were destroyed. The blast led to some structural damages to some walls and ceiling surfaces and disintegration of wall plaster adorned with mural paintings. Also, some dislodging of parts of the carved wooden ceiling structures was evident. However, most miraculously the ancient inner relic chamber structure at the centre of the Maligawa building where the Sacred Tooth relic was housed remained intact. When conservationists sifted through the rubble after the terrorist attack, they made an unexpected discovery. Beneath the existing wall paintings, two earlier layers of plaster with paintings were detected. Images of an elephant and a dancer’s leg were revealed which appear to be a part of a wider artistic composition of a ceremonial pageant. This painting is attributed to the beginning of the 18th century, to the period of King Narendrasinha. Fragments of these paintings are displayed today in the new Maligawa museum, along with pictures of the destruction wreaked by the terrorist attack. The earliest paintings of the period of the Mahanuvara kingdom are in the inner chambers of the Dalada Maligawa. They were completed during the reign of king Wimaladarmasuriya -II (1687-1707). Other paintings in the old Maligava building were done during king Kirthisri Rajasinghe (1747-1786). 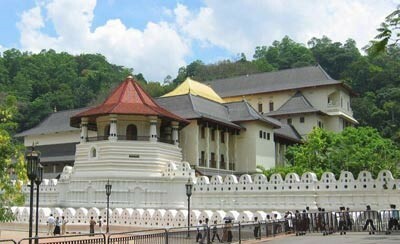 In front of the ‘hevisi mandapaya’ is the two storied building where the Tooth relic of the Buddha is enshrined. This was built by king Narendrasinghe who ruled from 1707-1739. The intricately carved wooden structures decorating the upper portion of the outer walls of the two storeys also contain exceptionally captivating paintings. Some of these paintings were done on plaster applied over wooden surfaces. Most breathtaking paintings of the Dalaga Maligava, found on its walls, ceilings, on wooden structures and surfaces and on the covers of the many ola palm leaf manuscripts found in the Dalada Maligava. The paintings on the walls and ceilings of both floors of the Maligava building are exquisite works of art. Most paintings are elaborate, thematic or decorative ones and those decorating the walls and ceiling of the inner relic chamber in particular, are most breathtaking. Paintings found on the carved wooden ceiling structures associated with the relic chamber. The wooden structures of the outer walls of the two storeys are decorated with intricate carving. Paintings found in these structures are exceptionally captivating. There are paintings of beautiful designs using human figures. animals, birds, and flowers. Among some of the most appealing paintings found here are those depicting King Wimaladarmasuriya-I (1591-1604), King Kirthisri Rajasinghe, Weliwita Saranankara thera, jataka tales and the Esala perahera. Paintings of the Suvisi Vivarana” or the 24 former Buddhas, deities and heavenly beings are captivating. The Dalada Maligawa museum established in recent years on the upper floor of the Maligawa Annex contains segments of the painting layers damaged by the bomb blast and photographs of some of the damaged original paintings and parts of the paintings of several inner wall surfaces that were exposed after as a result of the bomb blast and peeling off of walls. Canvas replicas of some Maligawa paintings adorn the stairways leading to the Museum. The destroyed moonstones and other rock structures have been replaced with new ones bearing the same shape and design and the ‘Ambarawa’ paintings have been re-drawn. However, can they ever replace these invaluable historic treasures, the unique cultural wealth that glorified and embellished this cultural paradise? The sacred Tooth Relic of the Buddha venerated by Buddhists all over the world is enshrined in this fabulous building. It is of utmost symbolic value for Buddhists and the Nation as a whole. Besides, the Dalada Maligawa is also famous internationally for it colourful 10 day procession called the Dalada Perahera, which has an unbroken tradition extending up to the 4th c .CE. This captivating and delightful pageant has been conducted for the past 1700 years in several historic capitals in the country, when it was customary for our kings to built special Dalada Maligava structures in those capitals to enshrine the Tooth relic. Sri Dalada Maligawa is one of the greatest national cultural treasures of our country and should receive the highest level of protection. Thank you Daya for another excellent article. It has been 20 years and only your article is featured on all media today of this important yet barbaric Tamil terrorist attack (at least of what I could find). It is important to attribute this to Tamil terrorists not just to LTTE as you have correctly done. LTTE is gone but Tamil terrorists are still living. Some Buddhist politicians have embraced Tamil terrorists who were responsible for the henious crime and also for the Aranthalawa Buddhist monk masscre (1987) and killing 600 policemen in the east (1990). Former Diyawadana Nilame refused to entertain a key organizer of these crimes when he visited the Maligawa. There are those who disrespected the sanctity of the Maligawa. The leader of the country was assumed to be the one who has the blessings of the Maligawa. Interestingly, this belief was proven again recently. Then there are those who try to devalue the importance of the Buddhist culture saying it is not Buddhism. No religion is based on tangible constructions but these are very much part of religious cultures. South Indian origin kings respected the Maligawa (in fact King Kirthi Sri Rajasinghe who started the Perahera is of South Indian origin) and a Muslim from the East donated an elephant to the Maligawa (depicted in a currency note). In this context, the crime and lack of punishment for the criminals are amplified. This entry was posted on Tuesday, January 23rd, 2018. You can follow any responses to this entry through the RSS 2.0 feed. You can skip to the end and leave a response.